Since the renovation of the Callaway Tasting Room the buzz about town is all about our bigger and better view. Being the first winery to be built in the Temecula Valley afforded Callaway the opportunity to pick a prime location, and what a location it is. 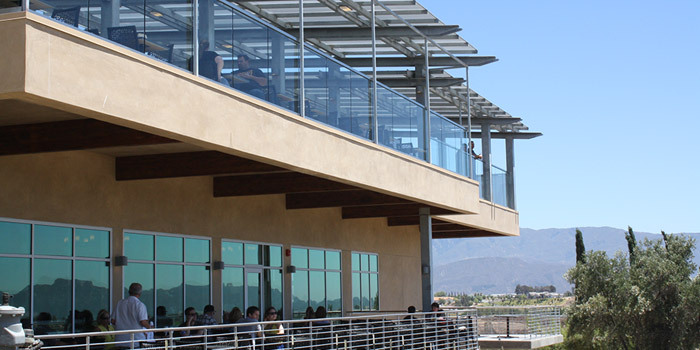 Built on a plateau 1600 feet above sea level, the winery tasting rooms is situated facing west overlooking vast views of the valleys in all directions. So what’s better than enjoying an amazing view in wine country? Enjoying that view while tasting fantastic wines, of course! For the last seven years the wines at Callaway have garnered numerous awards and every wine produced at Callaway has been offered for purchase and for tasting at our winery only. Those who haven’t visited the winery lately, haven’t tasted these highly awarded wines. We offer an extensive wine list and several wine tasting options so winery visitors have lots of ways to try our wines. For those who relish the opportunity to ask lots of questions and learn a bit more about the wines and the winemaking process we suggest tasting at the tasting bar where our friendly hosts are happy to share their knowledge and offer suggestions to suit the specific tastes of each guest. Our tasting room hosts also give guided tours of our production facility throughout the day so they truly know their stuff. For the tech savvy guests who would like to try something new, our self- serve, state of the art wine stations are fun to try! Every wine is stored in temperature controlled wine dispensers which have a preservation system that keeps the wine as fresh as the day it is opened, for up to 60 days. “Wine Debit Cards” let guests choose the wine and the size of the pour they wish to sample. The wine stations are even “smart” enough to pour to the very last penny of the debit card. This is a great way to taste wine with several friends at a flexible pace. Our new Wine Flights may be the best way to enjoy wine tasting at Callaway. Guests select three wines of their choice and a table on the tasting room terrace. Wine flights are served at the table and explained by our hosts before guests are left to sit back and savor the wines and the views. This is truly the best of the best wine tasting experience in wine country. We invite you to come see for yourself! There’s plenty of room and we can’t wait to serve you!